The benefits of organic farming for human and environmental health are broad and long-lasting. This fact sheet lists some problems with the mainstream food system and offers organic solutions, focusing particularly on the effects on children’s health. 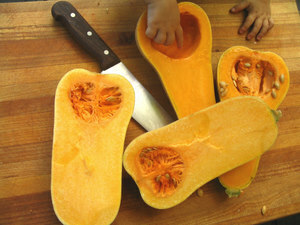 “Organic food benefits children in two crucial ways. First, it spares them the burden of exposure to pesticides, hormones and a host of other actually or potentially harmful substances. Second, organic foods are generally richer in “defense” compounds, like anti-oxidants and salvestrols, that aid a child’s immune system. 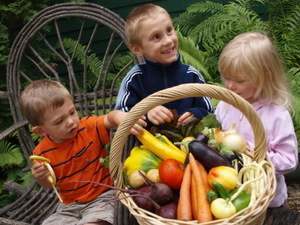 In both the short and the long term, therefore, children’s health benefits from organic foods.” – Dr. Warren Bell, The Canadian Association of Physicians for the Environment. Small children and infants are especially vulnerable to pesticides as they absorb substances faster and have more difficulty eliminating them. Their immature kidneys cannot excrete foreign compounds as fast as adults. Dietary intake represents the major source of pesticide exposure for infants and children, and this exposure may account for the increased pesticide-related health risks in children compared to adults. 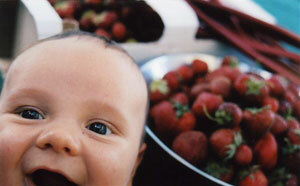 – National Research Council report, Pesticides in the Diets of Infants and Children, 2005. Children aged 1-5 ingest a combination of 20 different pesticides on any given day. American children five and under eat on average 8 pesticides every day and consume a dose of neurotoxic organophosphate insecticides (OPs) that the government deems unsafe. More than half of these unsafe exposures are from methyl parathion (used heavily on apples, berries, peaches and cantaloupe). – Wiles, R. et al, Environmental Working Group report “How ‘Bout Them Apples: Pesticides in Children’s Food Ten Years After Alar, 1999. The Environmental Protection Agency (EPA) admits that reliable toxicity data exists for only about 43% of chemicals in use today, and less than 7% of chemicals used in high volume are thoroughly studied. – Sheppard, J. Chemicals, Our Children’s Toxic Environment, pub. Holistic Pediatric Association, 2004. There is a 1:2 probability (50% chance) that a male born today will develop invasive cancer within his lifetime, and a 1:3 ratio for females. – The American Cancer Society. Source: Statistical Research and Applications Branch, National Cancer Institute, 2006. GMOs: The potential impact of GM foods on human health is untested, and little research has been published on long term environmental health. Pressured by the powerful bio-tech industry, our government fast-tracked GM plants and released them, ignoring the 87% of Canadian consumers who indicated that they wanted GE foods labeled. The Food and Drug Administration (FDA) silenced its own scientists’ warnings that more testing was needed before approval. Additives: The history of food additives is riddled with additives that, after many years of use, were found to pose health risks and were subsequently banned. Several studies have linked consumption of processed meats such as cold cuts containing nitrates to cancer in children. – The Center for Science in the Public interest, www.cspinet.org/reports/chem-cuisine.htm. Artificial flavors and colors, if taken over extended periods, are believed to be linked to hyperactivity in children, as well as asthma and cancer. – Pawlick, T., The End of Food, 2006. Antibiotics and Hormones: Animals raised using intensive livestock methods are routinely given “preventative” doses of antibiotics as well as growth hormones to increase weight as well as milk and egg production. Antibiotic residue increases tolerance to pathogens and can increase a child’s chances of having asthma. Parents, childcare providers, schools and the community can protect children by reducing or eliminating as many known or suspected contaminants as possible from our air, water, soil, food and consumer products. Pesticides: Organic agriculture bans the use of synthetic pesticides and fertilizers. GMOs: Organic farmers cannot raise GM crops, livestock nor use production aids that are genetically modified. Additives: Organic standards greatly limit the number of food additives allowed. Antibiotics & Hormones: Organic meat and dairy farmers are prohibited from using antibiotics and hormones. The Precautionary Principle is described as such, “when an activity raises threats of harm to human health or the environment, precautionary measures should be taken even if some cause and effect relationships are not fully understood”. Raffensperger, C. et al, Precaution: Belief, regulatory system, and overarching principle, 2000. Preschool children given an organic diet versus conventional foods found that “Organic diets can reduce children’s exposure levels (of organophosphorus pesticides) from above to below the EPA’s current guidelines, thereby shifting exposure from a range of uncertain risk to a range of negligible risk. Conclusion: Consumption of organic produce presents a relatively simple means for parents to reduce their children’s exposure to pesticides.” – Curl, C. et al, Dept. of Environmental Health, University of Washington. “In conclusion, we were able to demonstrate that an organic diet provides a dramatic and immediate protective effect against OP pesticides that are commonly used in agricultural production. We were also concluded that these children were most likely exposed to these OP pesticides exclusively through their diets.” – Lu, C. et al, Dept of Environmental and Occupational Health, Organic Diets Significantly Lower Children’s Dietary Exposure to Organophosphorus Pesticides, 2005.